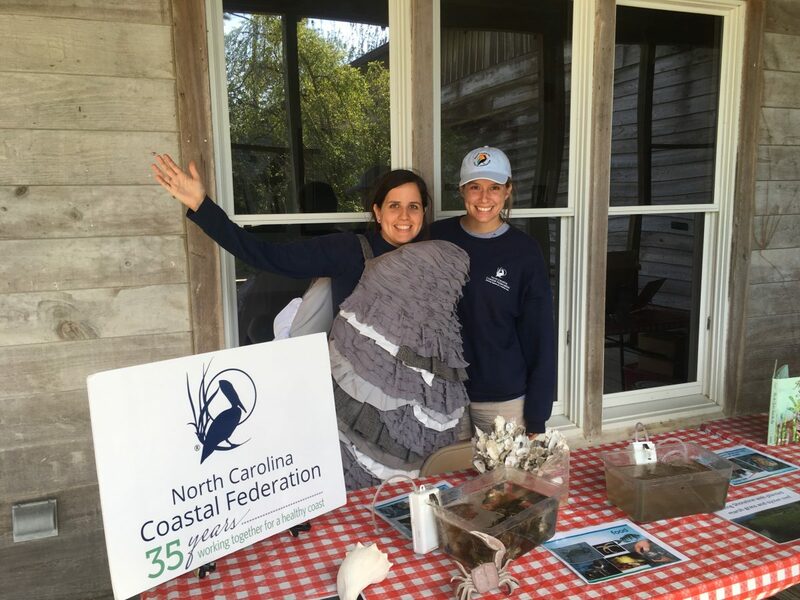 The North Carolina Coastal Federation staff spent a busy weekend celebrating Earth Day last month, with multiple events going on in all three coastal regions and in the Triangle. 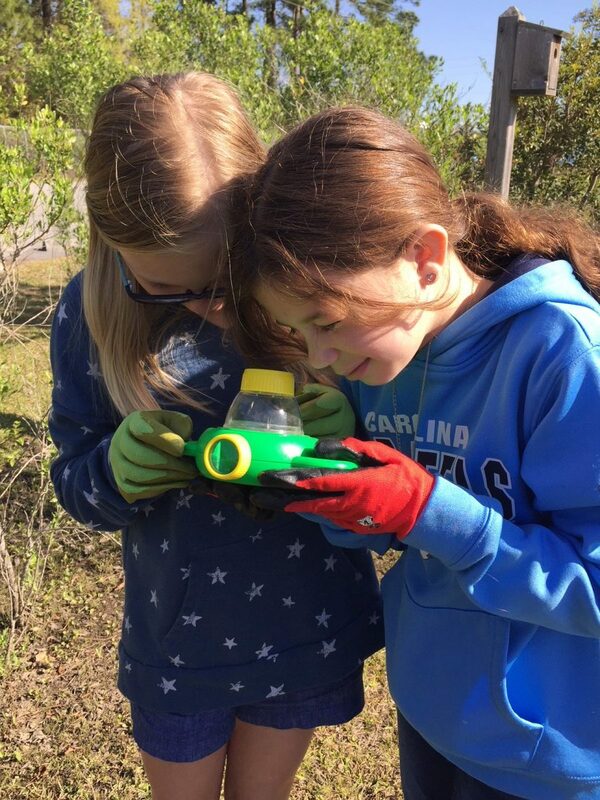 Earth Day is always full of events that get people outside and experiencing the coast, and federation staff are always excited to participate in the many festivals and educational days happening up and down the coast. Keep reading for a recap of the events staff attended. 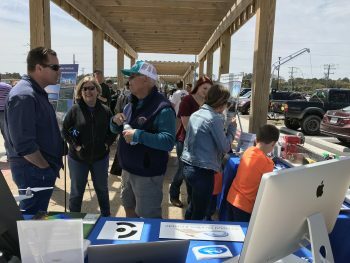 Over Earth Day weekend, staff and interns at the Wrightsville Beach office educated more than 120 people about oysters and stormwater runoff. 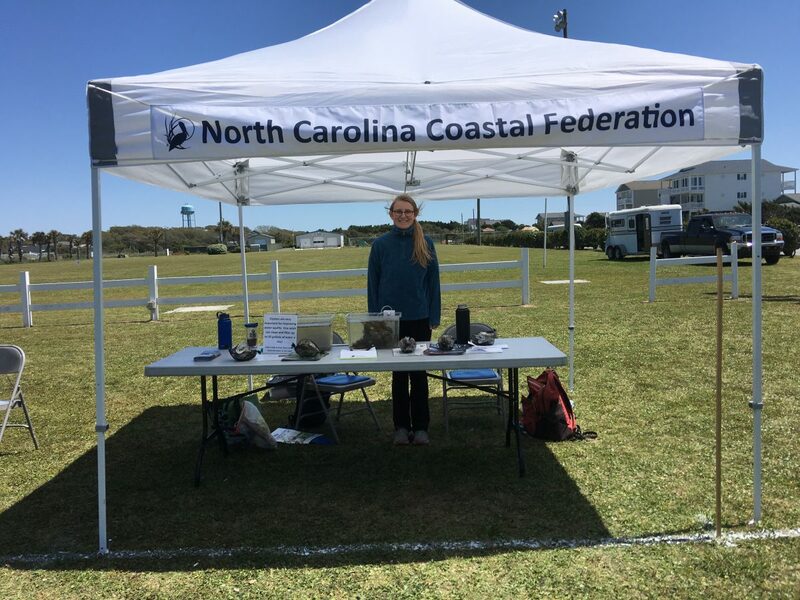 Kate Conery, AmeriCorps member, and Hannah Box, spring intern at the Wrightsville Beach office, went to the Oak Island Earth Day Festival on April 20. 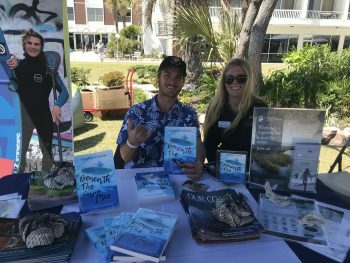 They educated festivalgoers about oyster restoration work and brought an oyster demonstration that showcased oyster’s filtration abilities. Several conservation organizations and others groups based in Brunswick County were also in attendance. “It was a great opportunity to mention the living shoreline project at Oak Islands Waterway Park and talk about our upcoming living shoreline at Sunset Beach Waterfront Park,” Conery said. 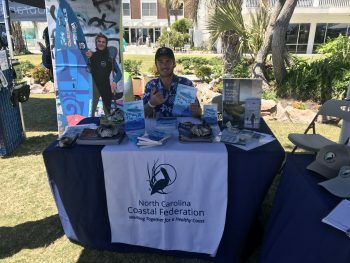 On April 21, Conery was joined by Cameron Smith, spring intern at the Wrightsville Beach office, for Earth Day Festival in Wilmington. They educated festival attendees on stormwater runoff using the stormwater model as a visual aid, which Conery said was a hit with the younger guests. 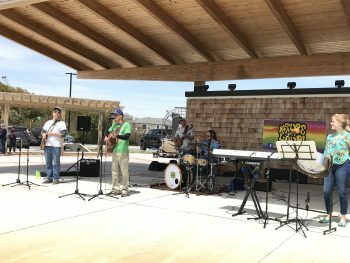 Most of the Wilmington-area environmental nonprofits attended this large-scale festival, which included live music and food trucks. 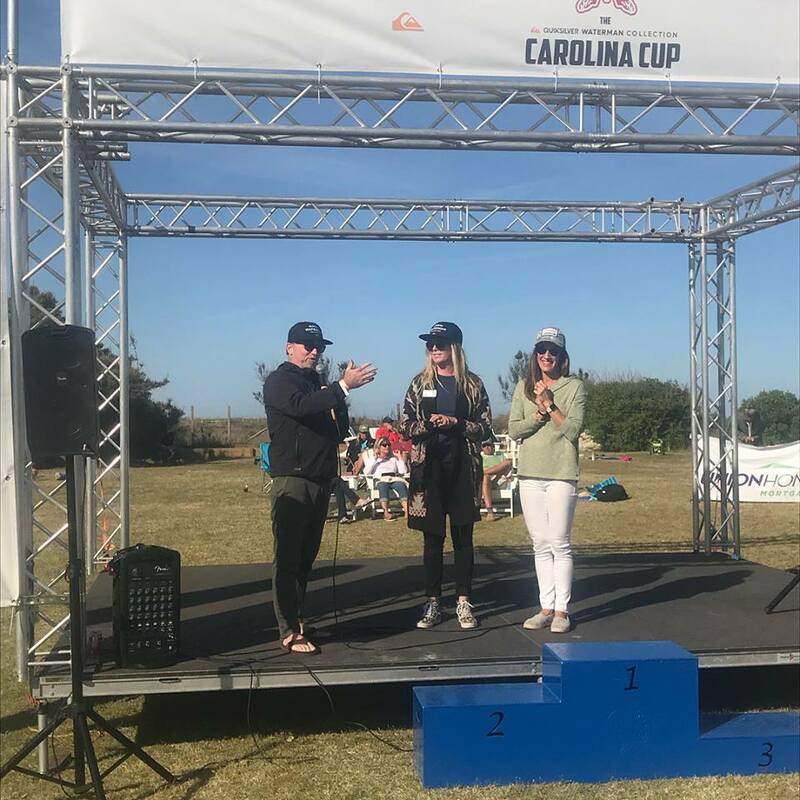 Staff from the Wrightsville Beach office were also at Quiksilver Waterman Carolina Cup, one of the largest stand-up paddleboard races in the world. 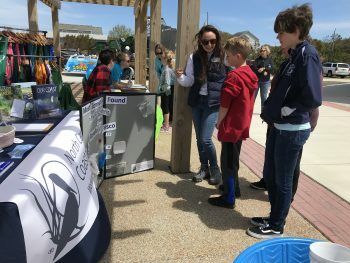 The Wrightsville Beach Paddle Club donated a portion of every registration fee to the federation again this year, and Quiksilver Waterman Collection donated 100 percent of the proceeds from its raffle sales to the federation. The event was from April 18-22. World-renowned professional waterman and environmental advocate Zane Schweitzer signed copies of his book, “Beneath The Surface,” at the federation’s booth and donated $5 to the federation from each book sold. The Wrightsville Beach office finished off the weekend with Cape Fear Wine & Beer (CFWB) on April 22. CFWB hosts “Sunday Beer Church” each week. 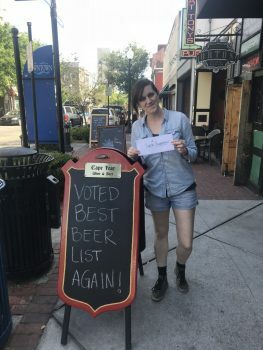 For Earth Day weekend, they had a special raffle of swag donated by Mother Earth Brewing. CFWB chose the North Carolina Coastal Federation to receive all proceeds from the raffle. Joan, CFWB staff member and secretary of the Cape Fear Craft Beer Alliance, handed off the donation to the federation on May 3. 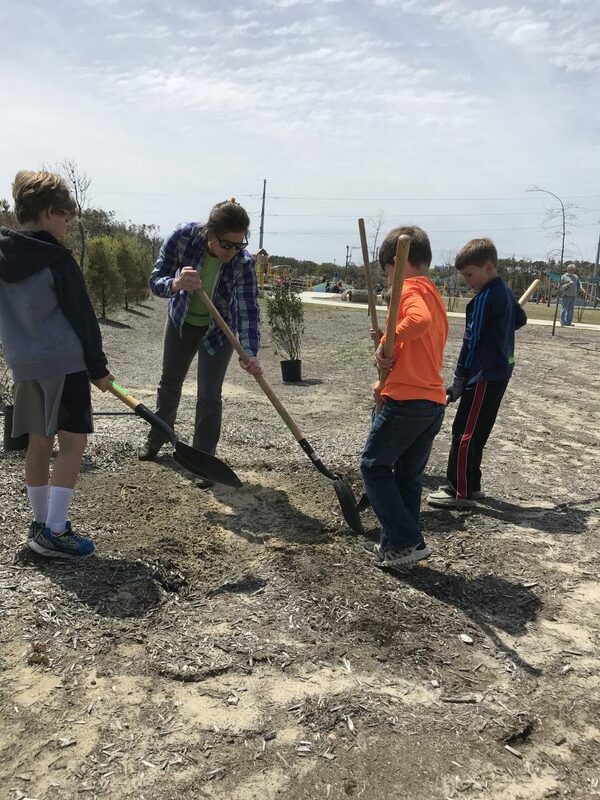 The Wrightsville Beach office is looking forward to working with the alliance, which will be volunteering on some living shoreline projects this summer. The Ocean office staff and interns were at three events over the days leading up to Earth Day. 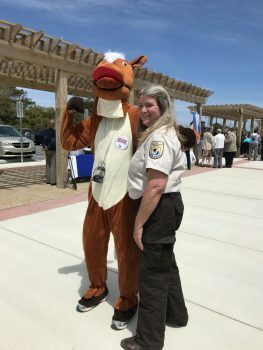 AmeriCorps member Kristin Gibson attended all three, through which she educated hundreds of people about the federation’s various projects and about the coastal environment. 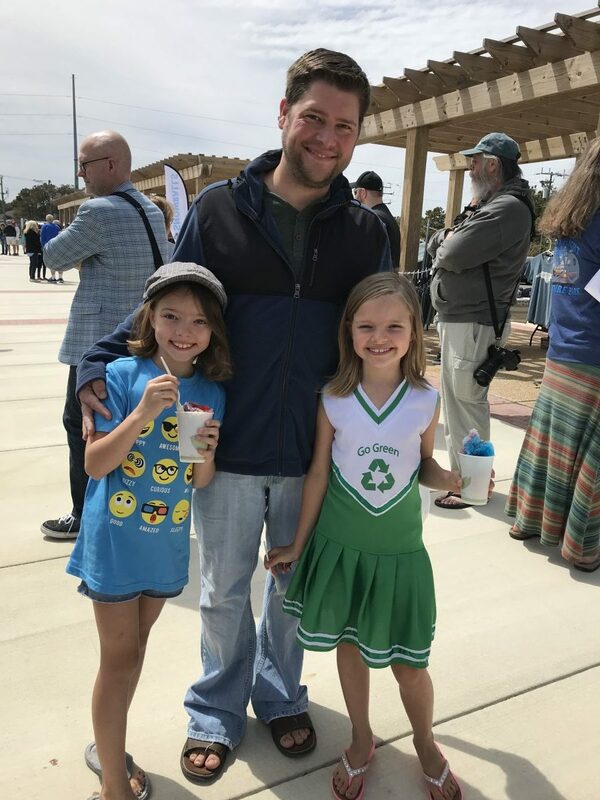 Gibson and educator Rachel Bisesi spent April 19 at Down East Earth Day in Carteret County. 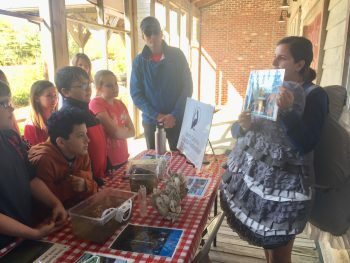 They set up educational activities focused on oysters for 425 students. They set up two tanks of water — one with oysters and one without oysters. The water in the tank with oysters was much clearer than the tank without, demonstrating oysters’ filtration abilities. 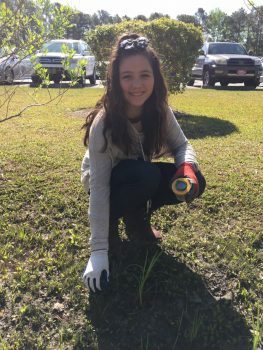 Other organizations in attendance included Carteret Big Sweep, Master Gardeners and Crystal Coast Beekeepers, among others. The next day Bisesi and Gibson went to Swansboro Elementary Science Day. 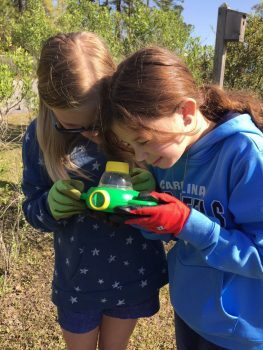 They worked with 91 fifth-grade students on rain garden maintenance. They also displayed the stormwater runoff model. The Outerbanks Wildlife Shelter and Hammocks Beach State Park also brought educational activities to the event. 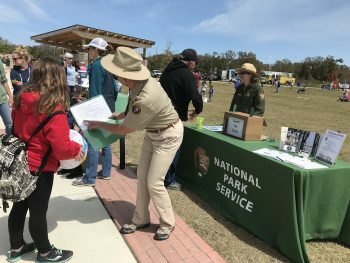 Finally, Gibson and the federation’s high school volunteer, Kristin Bell, spent April 21 at Fort Macon Earth Day, which drew more than 350 people. They again had the oyster tanks on display and informed people about all the great things oysters do for the coastal environment and economy. This event always draws a lot of people and organizations. Staff from the Wanchese office spent the afternoon of Sunday, April 22 at the annual Earth Fair OBX VI, which was held at Dowdy Park in Nags Head for the first time. Approximately 350 people attended the outdoor event, and more than 20 organizations were there with hands-on educational activities related to Earth Day. The full list is available here. 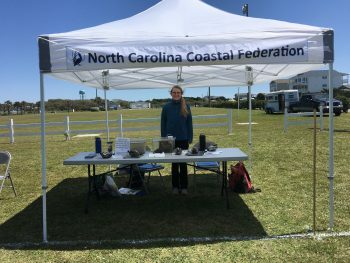 Sara Hallas, coastal education coordinator in that office, said the federation’s booth focused on marine debris. 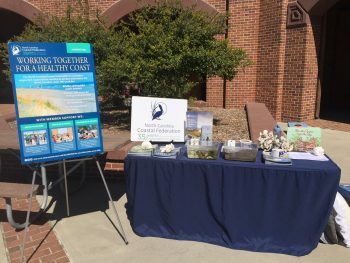 Staff set up a display board of the 15 most frequently found items found during beach cleanups from Corolla to Frisco. Attendees were tasked with sorting them from most to least often found. Staff also gave out coasters made of black-eyed susan seeds. After the recipient is done using the coaster, it can be put in the ground to grow into native plants, like black-eyed susans. Staff from the Dare Soil and Water Conservation District coordinated the planting of four northern bayberry shrubs at the park. This shrub is often found in the dunes of Dare and Currituck counties. 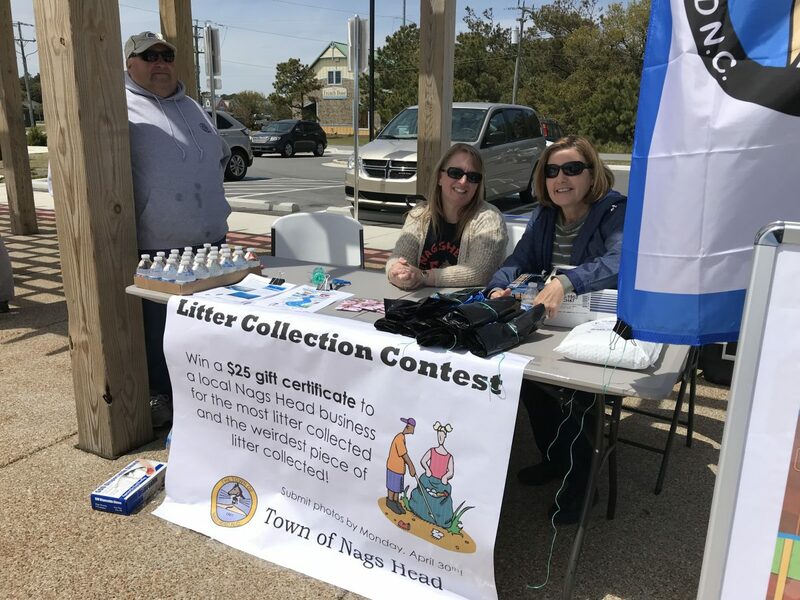 The Town of Nags Head made sure the spirit of Earth Day continued after the event, as it announced a cleanup challenge. Town staff passed out cleanup supplies and challenged attendees to conduct a cleanup by the end of April. 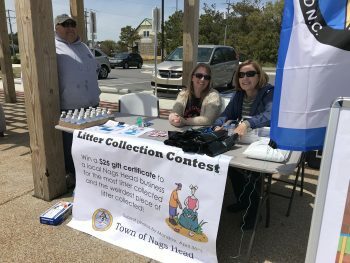 The town gave out a prize to the volunteers who collected the most trash, as well as to the volunteers who found the strangest item. As an added bonus to the Earth Day festivities, the SPCA set up a booth, and two local families adopted the two dogs staff brought with them. Overall, the day was one full of celebration with live music, support from local businesses and the unveiling of the town’s new mascot, Nelson Nag. The town also teamed up with the local restaurant Mulligan’s Grille to give out hot dogs to the first 200 guests. Nature Out Loud performed music inspired by nature, and the company Can Stand OBX LLC was on hand selling the “Can Stand,” which prevents trash cans from blowing over. As Local As It Gets was also there selling t-shirts and stickers, and it donated 10 percent of its proceeds back to the event. Over that same weekend, staff also worked with students from River City YouthBuild to plant a rain garden at the Shoppes at Renaissance Square in Elizabeth City. Read more. Kelly Bodie, membership director, spoke at EarthShare’s Corporate Earth Day Breakfast on April 27. EarthShare is a partnership of nonprofits and businesses that work together on promoting conservation. It pairs businesses with environmental nonprofits so that employees can participate in environmental activities. Recently, employees from The Frontier in Research Triangle Park bagged recycled oysters shells at the Orange County Landfill. These shells will be used in future restoration projects.